Don't Miss Our 5th Annual STEAM Fair on Wednesday, 4/24/19 at Northville High School! Please join us for the Fifth Annual Northville STEAM Fair (Science, Technology, Engineering, Arts and Mathematics) on Wednesday, April 24, 2019, 6:00-8:00 p.m. at Northville High School. Join hundreds of thinkers, dreamers, creators, and inventors — students from Northville Public Schools — during the Northville STEAM Fair Parent & Community Night! The Northville STEAM Fair is a collaboration between the Northville Educational Foundation and Northville Public Schools. District and School Annual Education Reports now available online from the Michigan Department of Education. 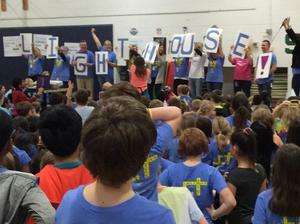 Northville Public Schools’ Amerman Elementary School has earned the distinction of becoming a “Lighthouse School” as part of the transformational The Leader in Me framework for schools. Attached please find the March edition of "A Message from the Superintendent," a communication with news about important issues impacting Northville Public Schools, as well as items celebrating some of the incredible work of our students, teachers and staff taking place every day in our classrooms and across our community. Northville Public Schools, and each of its schools, are engaged in an ongoing continuous improvement process, in which all of our stakeholders (students, parents and staff) play an important role. Tips for how parents can help students prepare for Michigan Merit Exam (MME) and Michigan Student Test for Educational Progress (M-STEP) testing which begins in April. Get answers to your questions about school funding, and so much more, at the Funding Our Schools: Answers to Your Questions community forum taking place on Monday, March 11, 2019. The Northville Public Schools Board of Education is proud to announce the successful sale of its 2019 School Building and Site Bonds, Series II, in the amount of $52,740,000 as authorized by the voters of the school district on November 7, 2017. Whether you are the parent of a kindergartener or a high school senior, Northville Public Schools’ Parent Camp 2019 has something for you. The Northville Board of Education is pleased to announce the upcoming sale of its 2019 School Building and Site Bonds, Series II, in the amount of $53,210,000. Due to the inclement weather, the February 12, 2019, Board of Education Meeting is cancelled. Are you a government employee whose family has been affected by the government shutdown? Families whose income has changed due to the furlough may qualify for free or reduced meals for your children during the duration of the shutdown. Northville Public Schools will be CLOSED on Tuesday, February 12, 2019 due to inclement weather. All afternoon and evening events have been CANCELLED on Tuesday, February 12, 2019, including the 2/12/19 Board of Education meeting. Keep warm and safe. For your information and planning, Northville Public Schools will be CLOSED on Friday, February 1, 2019. This decision is the result of weighing a number of factors, including the continued sub-zero temperatures anticipated through tomorrow morning, along with the wind chill advisory and challenge in getting our bus fleet back to 100% following several days of unprecedented cold. Northville Public Schools will be CLOSED on Wednesday, February 6, 2019 due to icy road conditions. All evening events are likewise cancelled on Wednesday, February 6, 2019, unless you receive specific notification otherwise from your coach and/or school.